Today’s sermon, the last of the year, deals with the martyrdom of twenty thousand Christians, whose sacred memory the Church celebrates today. They were martyred in 304 A.D. in Nicomedia, during the great persecution of Diocletian. The latter was augustus in the East, with his headquarters at Nicomedia, while Maximian was augustus in Rome. These two emperors ruled the Roman state, one in the West, the other in the East, from 285-305. These years were associated with the last great persecutions of the Church. Seven years later, in 312/313, Constantine the Great, who had grown up in Nicomedia as a hostage at Diocletian’s court, put a stop to the persecutions. In 305, after Maximian’s victorious campaign in Ethiopia, the whole of the Roman state wished to celebrate the victory. They sent off letters to all parts, inviting Roman citizens to come to the two capitals to enjoy the victory celebrations. The powerful Roman administration ensured peace and security, so people were able to travel across the vast expanses of the empire. The manner in which the Roman citizens were invited to the general festivities is similar to and calls to mind that in the Old Testament, in the Book of the Prophet Daniel, where the king of Babylon issues an invitation to all ‘peoples, races and tongues’ to come and worship his massive statue, which had been set up ‘on the plain of Dura in the province of Babylon’. It was the feast of Christmas [in 305], and the Christians of Nicomedia, together with their bishop (later to be hieromartyr), Anthimos, were gathered in the church for the Divine Liturgy. Diocletian believed that the Christians were the greatest obstacle for the reorganization he’d planned for the State and he seized the opportunity to burn them while they were assembled in the church. He inflamed the passions of a mob and got them to stack large piles of logs and brushwood outside the church. He surrounded the building with troops and then ignited the wood and shrubs. 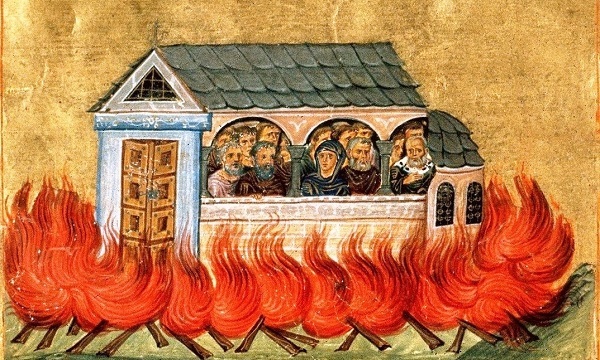 The whole church went up in flames and everyone who was inside praying was burnt alive. There must have been a great many of them, because the church would have been full at that time. Bishop Anthimos, the hieromartyr, had seen what was happening outside and realized what the result would be, so he immediately began to baptize the catechumens and to give communion to all those attending the Divine Liturgy. The Christians repeated ‘For our delivery from all sorrow, anger, danger and necessity’ many times and finally ‘we commend ourselves and each other and all our life unto Christ our God’. They remained locked in the church, watching the fire encircle them and became a whole burnt-offering to God, in the expectation and vision of the resurrection. By a miracle, the bishop wasn’t burned then, but was martyred later, and so took his place in the choir of hieromartyrs. The Church celebrates his holy memory on 3 September. Naturally, there weren’t twenty thousand people inside the church. That was the number who were martyred in the region of Nicomedia as a whole at that time. The burning of the church and all those inside was the most egregious event which remained in people’s minds as an inhumane action and repulsive crime. The Church has retained such events and remembers them with the utmost respect, according honour to those killed, as saints who were the victims of people moved by idolatry. This crime at Nicomedia wasn’t unique. The Church perpetuates the sacred memory of other unheard of crimes which were committed in antiquity and also in modern times. Every place and every time is replete with the relics of holy martyrs. Apart from the unnamed people in the congregation who were burned inside the church in Nicomedia, there were another ten whose names we do know. They were Christians of Nicomedia, but weren’t in church at that time. The persecutors searched for them and added them to the roll of the Church’s holy sacrifices. There were Indis, Gorgonios and Petros, who had rocks tied round them before they were cast into the sea. There was Zinon, the general, who was beheaded, together with the court official, Dorotheos. There were Mardonios and the priest, Glykerios, who were burnt alive. There was Deacon Theofilos, who first had his tongue cut out and was then decapitated. And finally there was Domna, who was captured as she went to bury the remains of those who had been burnt in the church. Amen.